Equipped with gradient three stage filtration, iSpring WGB32B whole house water system removes sediment, chlorine, rust, pesticides, herbicides, industrial solvents, VOCs, and various other contaminants. Equipped with gradient three stage filtration, iSpring WGB32BM whole house water system removes sediment, chlorine, Iron, Manganese, rust, pesticides, herbicides, industrial solvents, VOCs, and various other contaminants. Features Lead Iron & Manganese Reducing for your whole house. Filter housing wrench and user manual, black metal bracket, three big blue housings with caps, three filter cartridges, a 4.5 inch housing wrench, two 1'' MNPT X 3/4'' push-fit hoses, plumber's tape and a removal tool..
<li>Equipped with gradient three stage filtration, iSpring WGB32B whole house water system removes sediment, chlorine, rust, pesticides, herbicides, industrial solvents, VOCs, and various other contaminants. <li>With 1 inch NPT inlet/ outlet, it has minimum impact on water flow (up to 15 GPM) and requires minimum maintenance. Installed at the main water supply to treat all the water you use in your entire home. Enjoy better water from every tap and every appliance in the whole house. <li>Two 12 inch 1'' MNPT X 3/4'' push-fit hoses are included to provide a hassle-free installation to any 3/4'' pipe, including Copper, PEX, or CPVC pipes. <li>No welding or glue needed - just push in the pipe and it is locked in place. A removal tool is also included if you need to disconnect the system from the pipes. <li>Unlike an RO system, this system will NOT reduce Total Dissolved Solids (TDS), thus it keeps the healthy minerals in the water. <li>The first stage high capacity polypropylene sediment filter achieves filtration down to 5 microns. The second and third stage CTO Carbon Block filter uses high quality coconut shell carbon for maximum filtration efficiency and filter life. Both are tested by independent third-party to meet NSF/ANSI Standards. Both filters have a capacity of 100,000 gallon of water to supply one full year of clean water for a family of four. <li>Package includes - black metal bracket, three big blue housings with caps, three filter cartridges, a 4.5 inch housing wrench, two 1'' MNPT X 3/4'' push-fit hoses, plumber's tape and a removal tool. <li>Equipped with gradient three stage filtration, iSpring WGB32B whole house water system removes sediment, chlorine, rust, pesticides, herbicides, industrial solvents, VOCs, and various other contaminants. With 1 inch NPT inlet/ outlet, it has minimum impact on water flow (up to 15 GPM) and requires minimum maintenance. <li>Installed at the main water supply to treat all the water you use in your entire home. Enjoy better water from every tap and every appliance in the whole house.. Big Blue 20inches x 4.5inches filter cartridges allow for minimal pressure reduction and extended filter life <li>Unlike an RO system, this system will NOT reduce Total Dissolved Solids (TDS), thus it keeps the healthy minerals in the water. <li>The first stage high capacity polypropylene sediment filter achieves filtration down to 5 microns. The second and third stage CTO Carbon Block filter uses high quality coconut shell carbon for maximum filtration efficiency and filter life. Both are tested by independent third-party to meet NSF/ANSI Standards. Both filters have a capacity of 100,000 gallon of water to supply one full year of clean water for a family of four. <li>Package includes - black metal bracket, three big blue housings with caps, three filter cartridges, and a 4.5 inch housing wrench. iSpring iron manganese filter efficiently reduces iron (3.0 -> 0.01 ppm) and manganese (1.0 -> 0.01 ppm) and lasts up to 3 times longer than greensand. Filtration Capacity: 50k gal at 3.0ppm for iron. This whole house water filter can remove 95% of sediment, chlorine, rust, pesticides, herbicides, industrial solvents, VOCs, and various other contaminants that a regular water softener can't, although it does not soften your water. It is recommended that you install this WGB32BM whole house system after your water softener to achieve optimal performance if you have hard water. Q: How does this filter remove iron in the water? Does 6ppm to 0.01ppm apply to any water source? A: It depends on the quality of the source water. If the source water has a higher level of hardness, normally with TDS higher than 700, the resin in the filter could be saturated by Calcium, Lead, Magnesium and other cations, and would not be able to remove iron and manganese effectively. In this case, please install it behind a Water Softener that can either remove or neutralize these cations first in order to extend the lifespan of this FM25B iron manganese removal filter. <li>Equipped with gradient three stage filtration, iSpring WGB32BM whole house water system removes sediment, chlorine, Iron, Manganese, rust, pesticides, herbicides, industrial solvents, VOCs, and various other contaminants. <li>With 1 inch NPT inlet/ outlet, it has minimum impact on water flow (up to 15 GPM) and requires minimum maintenance. <li>Installed at the main water supply to treat all the water you use in your entire home. Enjoy better water from every tap and every appliance in the whole house. <li>Two 12 inch 1'' MNPT X 3/4'' push-fit hoses are included to provide a hassle-free installation to any 3/4'' pipe, including Copper, PEX, or CPVC pipes. No welding or glue needed - just push in the pipe and it is locked in place. A removal tool is also included if you need to disconnect the system from the pipes. <li>Unlike an RO system, this system will NOT reduce Total Dissolved Solids (TDS), thus it keeps the healthy minerals in the water. <li>The last stage FM25B iron and manganese removal filter efficiently reduces iron (3.0 -> 0.01 ppm) and manganese (1.0 -> 0.01 ppm), and lasts up to 3 times longer than greensand because the catalytic media is not being consumed in the process. <li>Package includes - black metal bracket, three big blue housings with caps, three filter cartridges, a 4.5 inch housing wrench, two 1'' MNPT X 3/4'' push-fit hoses, plumber's tape and a removal tool. 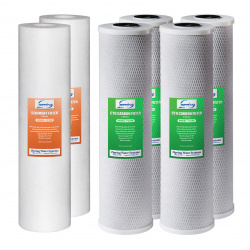 Low cost non-proprietary standard replacement cartridges 4.5" x 20" (one set of three is already included: 1 Sediment + 1 CTO Carbon + 1 Lead, Iron, Manganese Reduction Filter). *Note* The lead & iron reducing filter #FCRC25B's capacity for iron is much lower than the capacity for lead. Depending on the amount in your water, the filter may lose effectiveness in removing iron before the life of the filter expires. If iron is the main concern, you may instead want to look at using a filter specifically for iron such as the #FM25B, which is also included in our whole house systems #WGB22BM and #WGB32BM. Filter housing wrench and user manual, black metal bracket, three big blue housings with caps, three filter cartridges, a 4.5 inch housing wrench, two 1'' MNPT X 3/4'' push-fit hoses, plumber's tape and a removal tool. <li>Equipped with gradient three stage filtration, iSpring WGB32B-PB whole house water system removes sediment, chlorine, lead, Iron, rust, pesticides, herbicides, industrial solvents, VOCs, and various other contaminants. With 1 inch NPT inlet/ outlet, it has minimum impact on water flow (up to 15 GPM) and requires minimum maintenance. <li>Installed at the main water supply to treat all the water you use in your entire home. Enjoy better water from every tap and every appliance in the whole house. <li>Two 12 inch 1'' MNPT X 3/4'' push-fit hoses are included to provide a hassle-free installation to any 3/4'' pipe, including Copper, PEX, or CPVC pipes. <li>No welding or glue needed - just push in the pipe and it is locked in place. A removal tool is also included if you need to disconnect the system from the pipes. <li>Unlike an RO system, this system will NOT reduce Total Dissolved Solids (TDS), thus it keeps the healthy minerals in the water. <li>The last stage FCRC25B Lead & Iron removal filter features high capacity at 15,000 ppm for lead. Effectively reduces lead to below 15 ppb (EPA standard for drinking water) <li>Package includes - black metal bracket, three big blue housings with caps, three filter cartridges, a 4.5 inch housing wrench, two 1'' MNPT X 3/4'' push-fit hoses, plumber's tape and a removal tool.